When mapping objects automatically, TestComplete uses default predefined properties as object identification criteria that usually can accurately identify an object (ObjectType, id, value, and so on). However, for some modern Web applications, you can face issues when, for correct object identification, standard predefined properties are not enough. Such applications often don’t use standard attributes for object identification – instead, they use custom attributes for this purpose (like data-test-id, ng-model, ng-bind, and so on). In these cases, you can specify additional custom attributes (accessed using the attributes and dataset properties) of the corresponding web object. These attributes will identify the object uniquely. Applications created with React and AngularJS frameworks commonly use custom attributes for the object identification, so the approach described below is helpful for them. TestComplete provides access to attributes of web objects using the properties: attributes and dataset. You can view these properties in the Object Browser panel in the Advanced view mode. Using the attribute property, you can access any attribute of the appropriate web object via the dot notation. The dataset property provides access to data custom attributes (data-*). For attributes accessed using the attributes property, hyphens are replaced with underscores. For attributes accessed using the dataset property, data- are excluded from attribute names and names are converted to the camelCase notation. You can also create checkpoints to verify the values of custom attributes. Determine what attributes uniquely identify the needed objects. Add them to default predefined Name Mapping properties. This approach allows you to use Name Mapping more "consciously", because you know your object structure and pre-define which attributes will be used for Object Mapping. 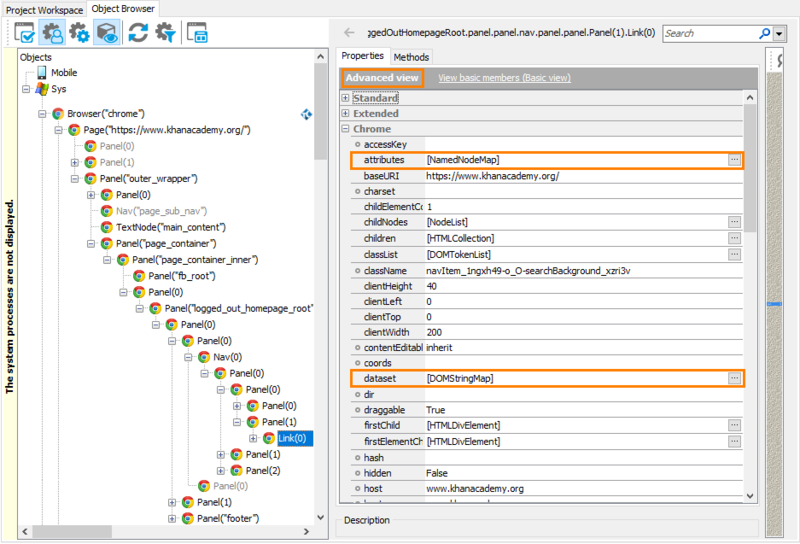 Select Tools > Current Project Properties from the TestComplete menu. In the tree on the left of the project properties editor, select Open Applications > Web Testing > Custom Attributes. By default, the list includes the data-test-id and data-testid attributes. These are the most commonly used attributes in applications created with the React framework. Click Add on the Custom Attribute page and type a custom attribute name in a new line of the list. 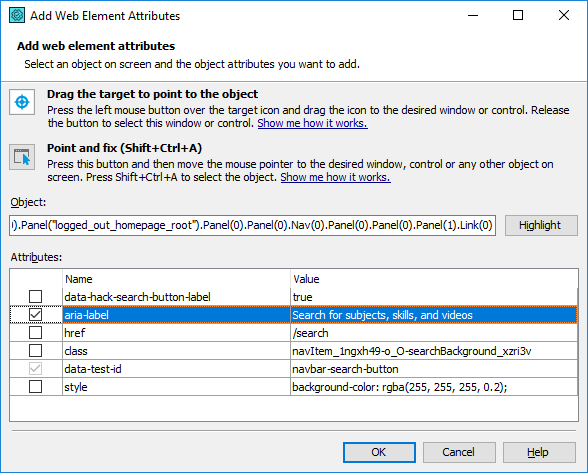 Click Add From Screen and select the object, whose attributes you want to use, via the Add Web Element Attributes dialog. Drag the target icon ( ) to the desired onscreen object. Wait until the red frame appears around the object and release the mouse button. 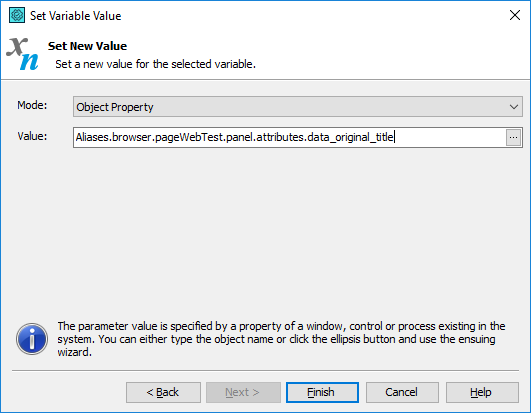 TestComplete will display the selected object in the Object box and the corresponding available object attributes in the Attributes box. For more information on how you can specify an object on the screen, see Add Web Element Attributes Dialog. You may find the second technique more convenient than using the target icon, because you can manipulate applications before actually selecting an object. For example, you can open the tested application window containing the desired control and so on. Unlike using the target icon, with this technique, you can point to popup windows, tooltips, and other objects that are hidden in the application when being inactive. Instead of selecting the object, you can copy its name from the Object Browser, keyword test, or script code beforehand and paste it into the Object box. To make sure you have selected the correct object, click Highlight. TestComplete will highlight the appropriate object on the desktop screen. Note: The previously-added attributes are disabled in the Attributes box. 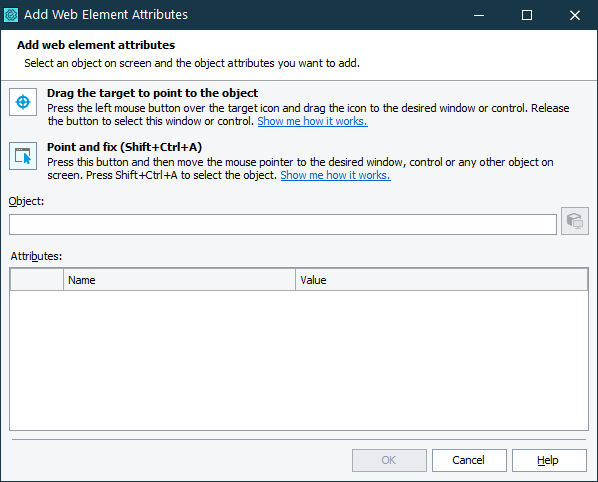 Click OK to apply changes and to close the Add Web Element Attributes dialog. Custom attributes added to this list will be used as additional name mapping criteria if it is required for the object identification. 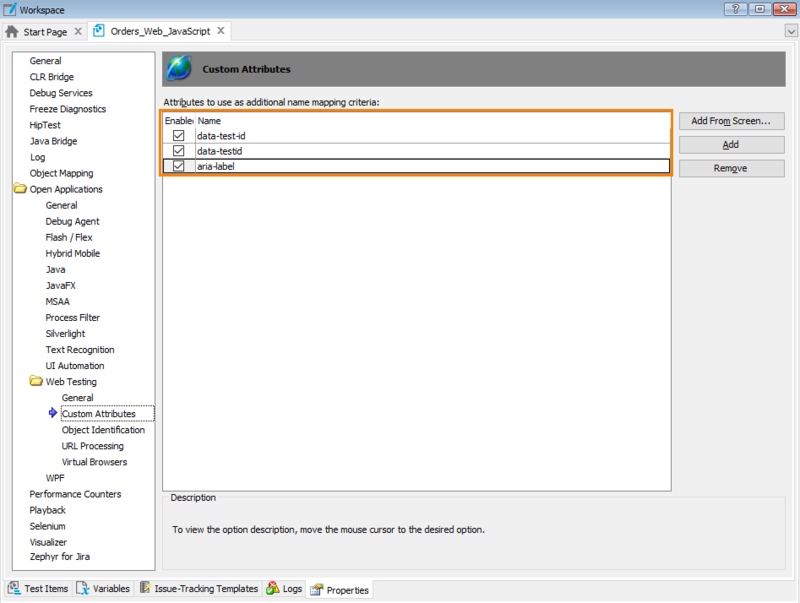 To delete the selected custom attributes, click Remove on the Custom Attribute page. Alternatively, you can temporarily disable attributes as additional name mapping criteria by clearing the appropriate check boxes of attributes. If you want to use the appropriate custom attributes for your newly created projects, specify the needed attributes using the Project > Open Applications > Web Testing > Custom Attributes option on the Default Project Properties page.